Plymouth Sound is the most beautiful natural harbour and yet I rarely visit, I suppose because it's not on my doorstep. However it's not far away, and a group of us set off one surprisingly sunny November Sunday for what turned out to be a fascinating walk and couple of swims into the city's naval (and other) history. 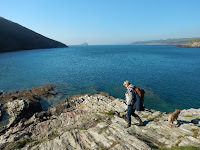 We set off from Jennycliff, and the first stop was Batten Bay, a gorgeous little beach with numerous rocky channels and inlets and great views over to Drake's Island. The water was clear and still and blue. A vast warehouse looms up behind the beach, but only adds to the unusual maritime/urban setting. 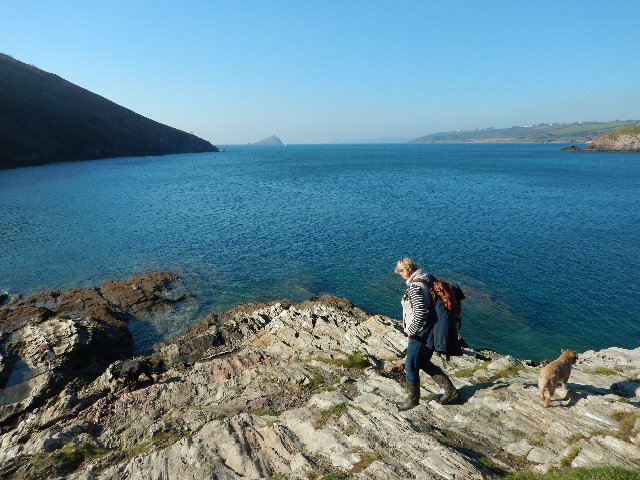 We then walked on around the Mountbatten Peninsula which is like a little island protruding into the Sound. We walked past the foot ferry, and through boatyards, looking across to Tinside, home of the famous pool, on the other side. We walked through the old village of Turnchapel, and past the old Royal Marines base. We ended up at Hooe Lake, a tidal inlet where we had another peaceful swim out to a couple of boats moored in the middle. I spend a lot of time dreaming about swims, but also looking longingly at the OS map trying to find new places. For some time I've been curious about a waterfall at the very northern end of Slapton Sands but never got around to checking it out (partly put off by the long walk). Finally, on a dreary autumnal day, Alex and I set off to find it. The environment down there is bleakly beautiful. Sea and shingle stretch for miles, unusual, silver-green plants grow, and the cliff - aptly named The Slide - rises starkly behind. As we started on the long trudge to the end we saw a flock of goldfinches feeding on swaying seed heads. Finally, we reached the end, but no sign of the waterfall. Alex stopped for a vape break, but I kept on going, and then heard the sound of rushing water. There, hidden in the rocks, was a twenty foot waterfall pouring down from the cliff above, into a small pool, like a mystical crucible. As it turned out, it was the last day of the Indian Summer. The date was November 2nd, and our lovely friend Charlotte (one of the Scottish Swimming Lassies) was visiting. Talk about the weather behaving in her honour. We arrived at Cellars Beach, Noss Mayo, to find sparkling clear sea, and I think you'll agree the pictures (taken by Charlotte) look just like summer. 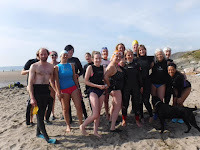 We got in the water, swam around the rocks and made our way up the estuary, weaving in and out of channels and marvelling at the clarity of the water. Anna spotted a starfish, well camouflaged and clinging to a cleft in the rock. Numerous little white winkles sparkled like fairy lights underwater. The dogs had a rather hazardous time keeping up with us from the shore, slipping over the ledges and making inelegant jumps. In all we stayed in about half an hour; the sea was warm and it just didn't feel like November . Just because a beach is in the middle of a conurbation doesn't mean it's not wild. 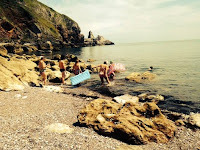 Anna, Ellie and I set off for Armchair Cove in Paignton, which you can get to via a suburban street and a short walk past a holiday camp and under the railway line. You emerge into a green and blue heaven, a grassy cliff top with the sea spread out in front of you like a magic blue carpet. Armchair Cove is tucked away under the cliff, a small oasis of calm fringed with exotic, Gaudi-esque rock formations. The water was very clear for the time of year, and warm, at 14.7, and we swam around, heads permanently down, marvelling at the beautifully coloured seaweeds and intricately twisted rocks. Then there was a shout. "Green anemones" cried Anna, and there they were, snakelocks anemones rippling in the water, green ones and pink ones, surrounded by a kaleidoscope of pinks, purples, browns and greens. Shilley Pool, near South Zeal, is the perfect aquatic playground. It comes complete with a huge water slide, and an infinity effect, all set in a very pretty corner of Dartmoor. We walked there via the scenic route, which involved a lot of climbing uphill, and also some unnecessary climbing uphill due to, ahem, a map reading malfunction. However it was all worth it for the views, and for an absolutely magnificent triple stone row which we went to see before descending to the pool for a well-earned plunge. Thanks to Ron for the water spouting photo! Winter swimming has a rhythm that summer swimming doesn't. The summer is full of events, there's no routine. I love it, the weather is (relatively speaking) good, and you're out there all the time. In winter, it's tougher but there's more ritual and more regularity. 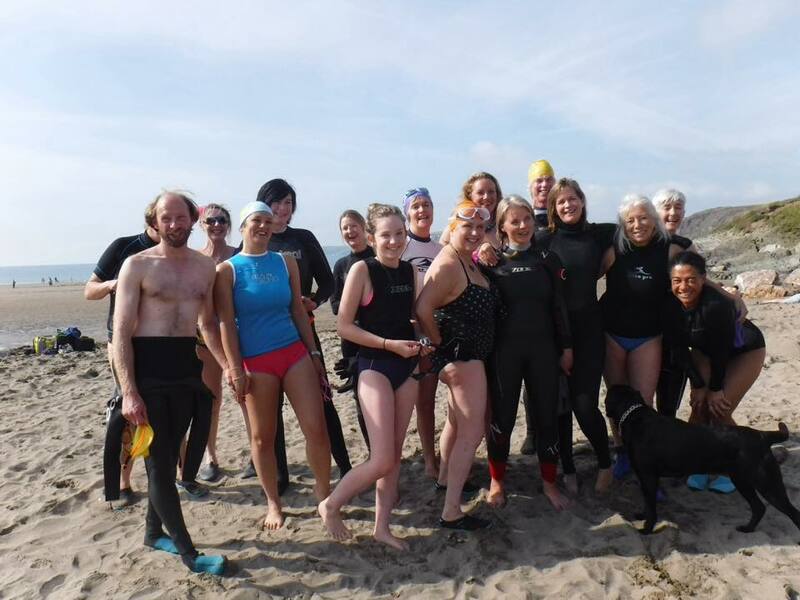 Every Sunday morning throughout the year a group of us meet to swim in the Dart, and today I got back into that routine. The season has changed, and it's much colder, so there was the paraphernalia of boots, gloves, warm clothes for afterwards, hip flask etc, to consider. There was the ritual bankside speculation about the temperature of the water, the ritual noises on entry, the ritual commentary on the nature of the cold. 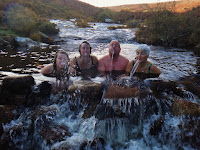 Although it was undeniably cold, at 9.9 degrees, we had a beautiful swim and stayed in for about quarter of an hour. There was a delicious purity about the water which set me up perfectly for the day. 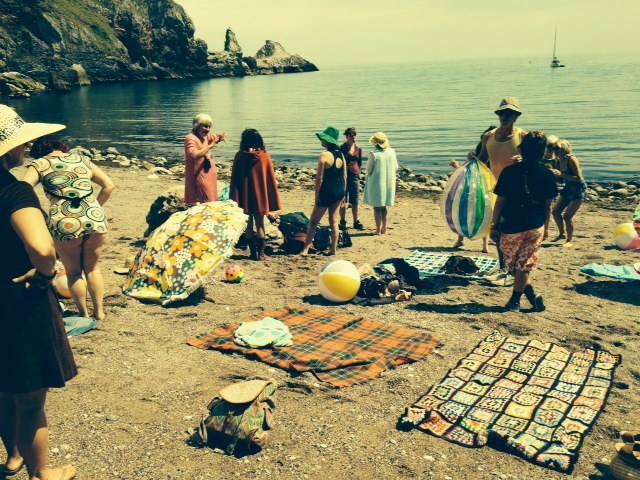 I've always been fascinated by the Parson and Clerk rocks at the northern end of Teignmouth beach. The name, their position, the arch which cries 'swim through me' and the mystery of what is on the other side, all conspire to draw me towards them. So it was unfortunate that the day we wanted to swim to them (and through them) there were Easterly winds, meaning the sea was choppy and brown. Still, I was determined to give it a go, and the lovely Martin came too. Although the sea looked a little daunting from the shore, in fact once we were in, it felt fine, it was just incessantly bouncy with waves coming at us constantly. We ploughed on and eventually reached the gap through the Parson, where we were swirled around like clothes in a washing machine. It was exhilarating, though I am looking forward to going back on a day when there is flat calm and crystal clear sea. Here's a short video. Birthday tradition dictates that I MUST swim around Burgh Island if at all possible, but it's always a toss-up as to whether it happens. In past years we've had driving rain and huge swells, but this year, well, we lucked out. The sea was flat calm and we pootled around the island, clockwise, which is controversial but my favourite way of doing it. As we approached the chasm at the back, the cormorants lined up to salute us. There was a bit of scrambling towards the end of the gulley, but then it was out and through and into the most diverting maze of channels and slowly swirling seaweed. Towards the end we saw carpets of snakelocks anemones covering the rocks, almost like pink moss. I have never seen them in such profusion. Back on the beach we warmed up in HOT sun, so welcome after a lot of dreary weather, and ate oodles of cake. Perfect. 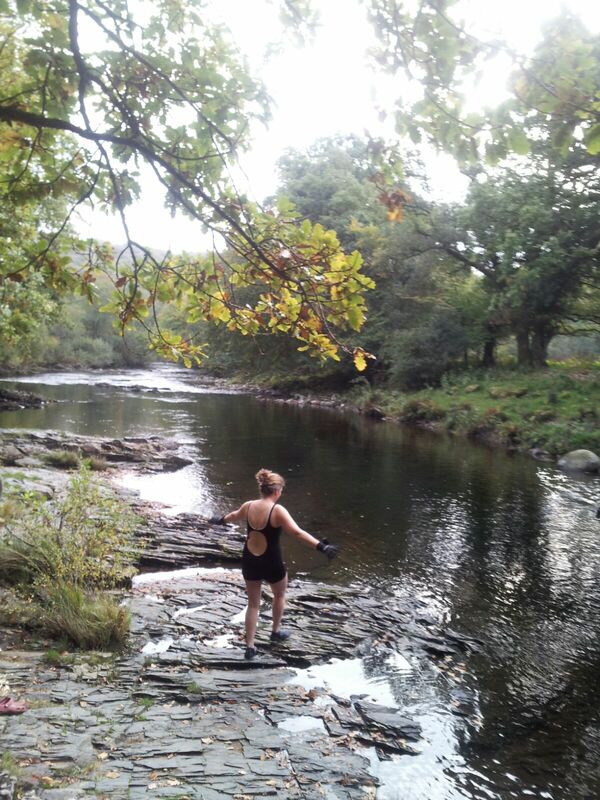 Well, I know where it's gone, I've been busy swimming, and working on a new book of wild swimming walks with my pal Matt Newbury, assisted by all our amazing Devon swimming friends. It's been an uphill task at times, as the weather has not exactly been helpful. Trying to find routes and look at ancient Dartmoor monuments in thick fog - in August - well, we had to give it up as a bad job in the end, but not before getting a dip in (we're made of stern stuff). At other times the sun shone and we had great times camping, getting burnt and finding new routes along the incredible Devon coastline. Here are a few (unedited) photographic highlights which I think illustrate the vagaries of the Great British Weather. I hope to resume normal blogging service soon. Out on the western side of Dartmoor, it feels at times like the Lakeland Fells. We clambered up the West Okement and got an exhilarating pummelling in a double waterfall amongst huge boulders lined with ferns. We then had an 'up close and personal' nature moment in a bog, where we found a beautiful insect-eating plant, the sundew. Next stop was ancient Black-a-Tor Copse, before a climb up to Black Tor and spectacular views over to High Willhays, the highest point on Dartmoor. 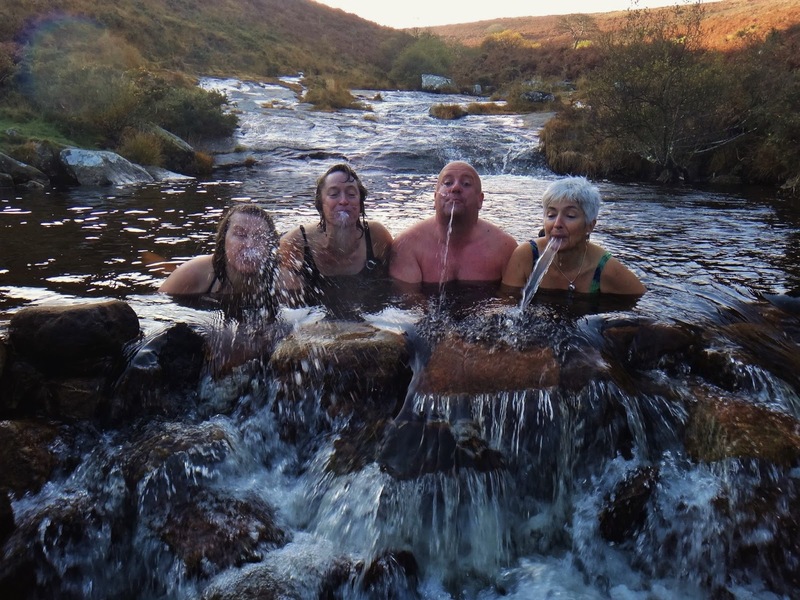 We then hiked back in the hot sun and had the most delicious, languid and welcome swim in magical Meldon Pond, where the temperature in the water was 19.5 degrees. My friend Rachel has been trying to find a hidden waterfall on Dartmoor for at least fifteen years, after a friend told her about it in glowing and rather mystical terms. It's called Shavercombe. She's had at least two aborted attempts; the latest was with me, a couple of months ago, when the weather was so wet and awful we had to give up our quest after getting stuck in bogs and failing to ford a river. Today, after a long dry spell, it seemed the right time to try again, and we set off full of anticipation, but trying not to get too excited, in case fate intervened again to prevent us reaching our Holy Grail. The Moor was beautiful. Larks were everywhere, flitting around down low as well as high above us, and clumps of bog cotton dotted the wetter areas. We found the stream and made our way up it. It was tiny, and it hardly seemed possible there could be a waterfall, especially in the rather featureless Dartmoor landscape. But suddenly, up above, we could see a patch of green, and sure enough, there was the waterfall, enclosed by a network of branches, like a moss-lined room. It was enchanting. The weather has been glorious for the last two weeks, and the water temperatures have been soaring. In the East Dart at Bellever I wallowed, watching an eel, in a shallow pool where the temperature was an astonishing 17.5. During the last week we've been swimming most nights in the SSS (swift swim solution) pool - where the temperature has averaged between 15.5 and 16 degrees. And in a lake on the Moor one night it was 19.5. Plus, the chanterelles are out, with great pickings, especially for June. And by happy coincidence, they grow near our swimming places. Black forest gateau, pineapple upsidedown cake, crimplene, psychedlic prints, brown towelling and a particularly lurid pair of orange trunks all made star appearances in our 70s splashmob at Redgate Beach in Torquay. My pal Matt had the idea, after feeling sad that the beach, which was packed in its heyday, is now officially out of bounds - according to the council at least - because there's no safe way of getting to it. Undeterred, we climbed around the rocks at low tide, armed with lilos, beach balls, and other paraphernalia, and set up camp on the beach. There was a 70s spread of egg rolls, quiche, and pineapple and cheese on sticks, as well as the aforementioned cake. 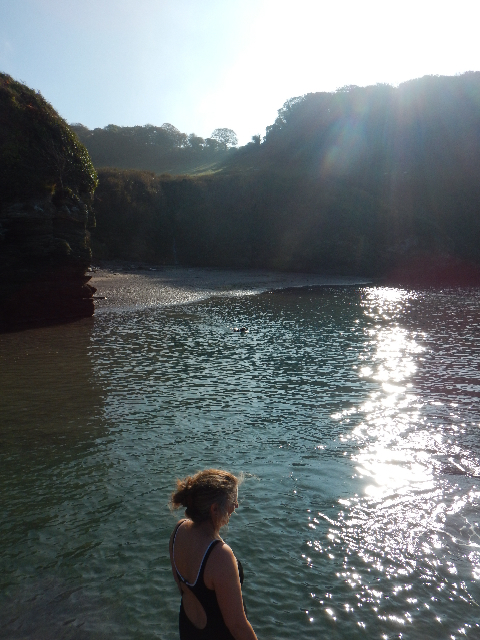 Very obligingly the sun came out - just like the heatwave of 76 - and the swimming was divine, in calm, warm water. In 1938 my father Roger and his brother Barry went with their grandparents to stay with a fishing family on a very remote part of the Devon coast, at Ivy Cove near Start Point. It was very different then, with its own little fleet of fishing boats. I have a little album of snaps his grandmother took with her box brownie, and I decided to go and retrace their steps, and try and recreate some of the photos in the present day. As we approached Ivy Cove, we came across a couple and their grandchildren and got into conversation. It turned out he was the local farmer, so I showed him the album, and told him how Dad used to stay with a family called the Logans. "Oh Bill Logan still lives there" was the response, and apparently I'd find him working in his garden. Sure enough, at Ivy Cove, there was Bill tending his broadbeans in his veg patch overlooking the sea. I introduced myself and it turned out Bill had a photo of my great grandfather - except he'd never known who he was. We then went down to the beach which was truly beautiful: shimmering white shingle, crystal sea and a raised platform of rock laced with gullies and chasms. It was so strange to think of my father and his brother fishing, swimming and diving here nearly 80 years earlier. Tragically Barry was killed in the final stages of the war just 7 years later, aged 23. Setting off to see one some of the most spectacular stone rows on Dartmoor in heavy mist is not very clever. But we did it anyway, amid dreary dampness; perhaps the name should have given us a clue. Well it certainly drizzled, but in fact when we finally found the stones they looked rather haunting, shrouded in the mist which lifted and sank again, bringing them in and out of view. 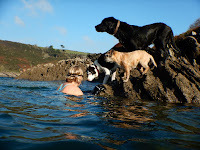 We then headed down to the Plym for a swim in what I call "Warhorse Pool" - because it's just below the old farmhouse at Ditsworthy Warren, which played the part of the family farm in the Steven Spielberg film. 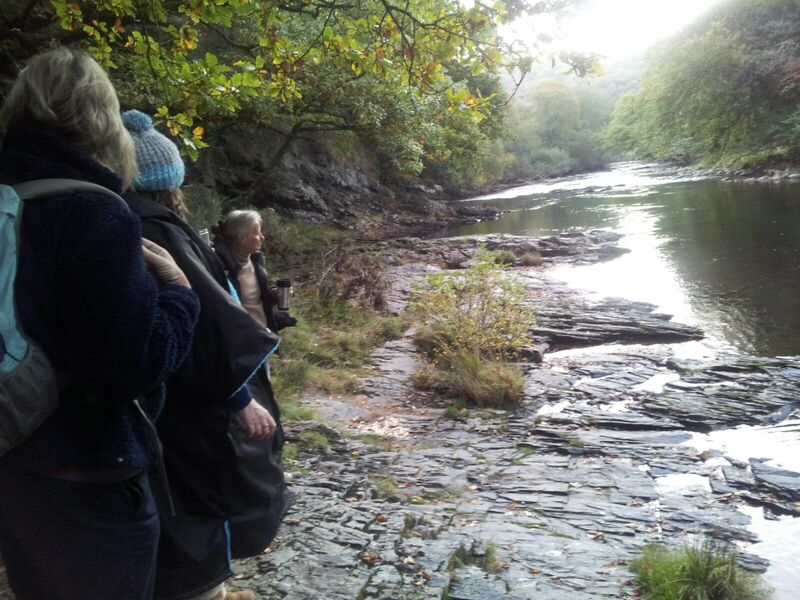 The river was running high, the colour of cola, and as we swam upstream we could see the large terminal stones of the row standing like eerie figures in the distance. I have always wanted to swim at Sandy Hole on the East Dart, and today I got my chance. Judy led the way as a group of us set off from the car park at Postbridge. The surroundings grew gradually wilder, in sepia hues, as we hiked out onto the High Moor. At the top of Broad Down the 360 degree views were spectacular. We could see the East Dart below, and in the far distance the little gorge that is Sandy Hole Pass. The perfectly round pool is downstream of the pass, and was created by either people cutting peat or by tinners. As we got in our feet sank into silky smooth mud, and we were surrounded by black earthy walls, topped with grasses and occasionally fringed with minty green reeds. The sky was vast above us. I loved the feeling of the mud and rubbed some of it into my skin. 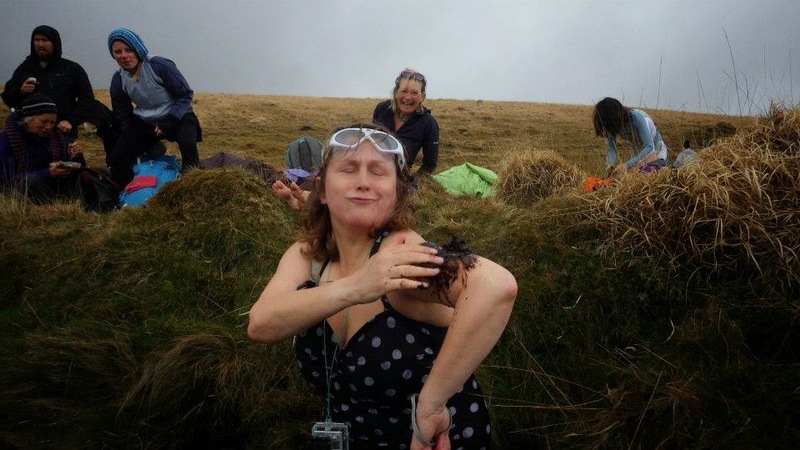 I'm definitely going to head back there in the summer for a full Dartmoor mud treatment.